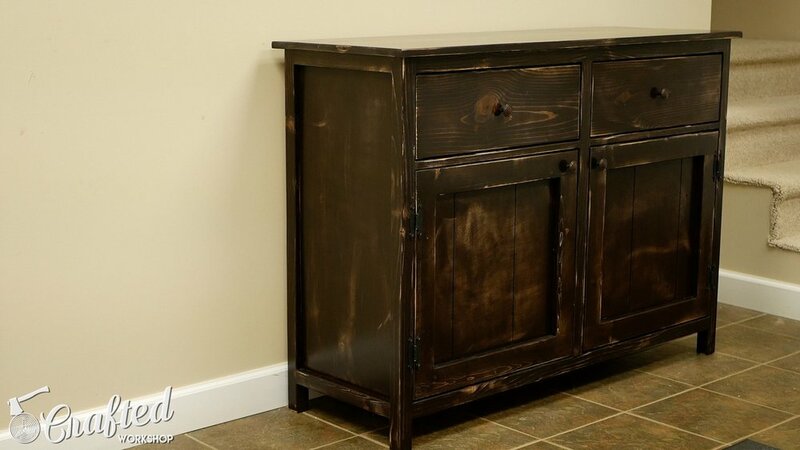 In this video, I’ll be building this farmhouse-style DIY sideboard / buffet cabinet. I have plans for this DIY sideboard available here. This is a great pocket hole project for a relative beginner, since you won’t need a ton of tools. 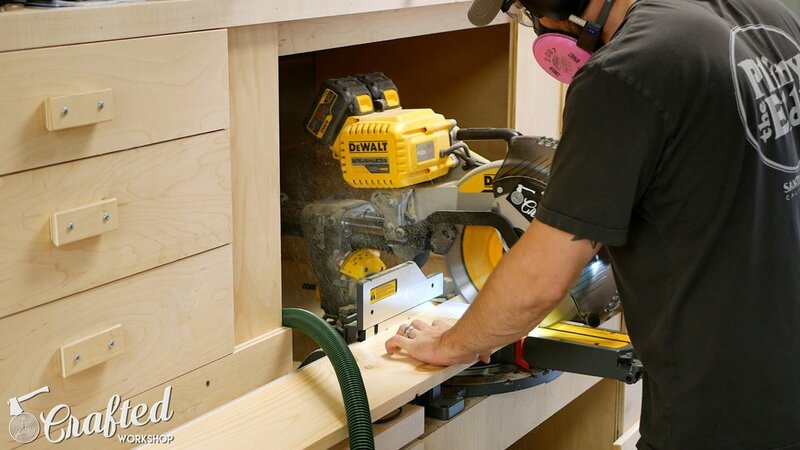 A table saw, miter saw, pocket hole jig, and drill are the only tools you’ll need to complete this piece. You could even break down these pieces with a circular saw if you don’t have a table saw or miter saw. Let’s get started! First, I assembled the top of the sideboard. The top is constructed from two pieces of 1x8 material and one piece of 1x4 material. I cut some biscuit slots to help with alignment, an optional step, and then glued the pieces into a panel. While the top panel dried, I continued breaking down the other pieces for the sideboard. This piece is built from one sheet of ¾” and ¼” Purebond plywood, and various dimensional lumber, including 2x4s, 1x4s, 1x6s, and 1x8s. I broke down my pieces on the miter saw and table saw. Again, you could use a circular saw here if you don’t have access to these tools. 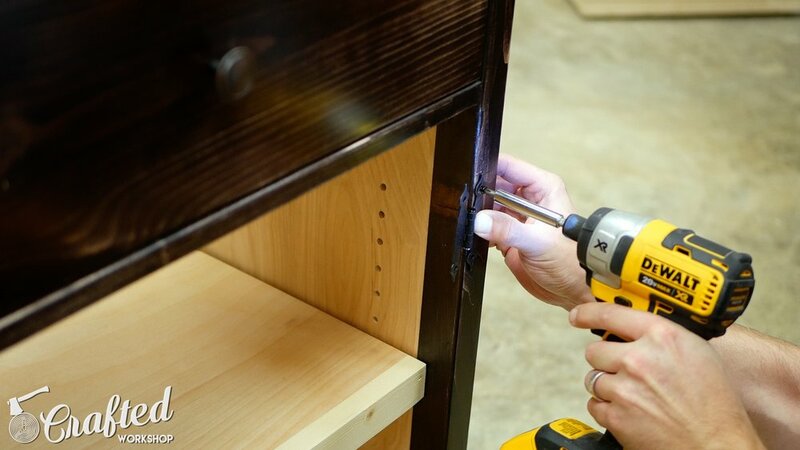 The DIY sideboard uses pocket hole joinery, which is a quick and efficient way to put together cabinets. I drilled the pocket holes and then began assembling the structure. The legs are made of 2x2s and are joined by 1x2 rails. I then added a piece of ¾” plywood to make up the panel structure of the sides. This is held into place using pocket holes and glue. Next, I attached the front and back frame pieces to the sides. The front frame is made up of 2x2s and the rear frame is made up of 2x4s. The top 2x4 is ripped to 2 ½" wide to make room for the drawers. Also, I made sure to orient my pocket holes facing the rear or bottom of the cabinet. This way, no pocket holes will be visible in the final piece. The face frame pieces include a center vertical 2x2 and horizontal 1x2s. These are also attached with pocket holes. The bottom of the cabinet is made up of ¾” plywood, and, again, I used pocket holes to install it. Make sure to space the bottom evenly to make sure it’s level inside the cabinet. Next, I glued up two pieces of ¾” plywood to make up the center panel. The two panels glued together fill in the space in the center of the cabinet, which allowed me to use standard drawer slides. I could have cut spacers for the drawer slides to fill in the extra space, but I found it easier just to double up the center plywood panel. This center panel is also attached with pocket screws. I also drilled one pocket hole on each side of the top center of the panel to attach the top later. Do not drill pocket holes on the back edge of the center panel. The back will be made up of ¼” plywood and won’t support pocket screws. Next, I cut some shallow grooves on the door panels, which are made from ¼” plywood. This gives the cabinet doors a paneled look without having to use actual wood panels, which can cause wood movement issues in doors. I evidently lost some footage of assembling the rails and styles of the door frame, but they were just assembled with more pocket screws. If you haven't already noticed, this build falls heavily into the "pocket hole projects" category. These types of woodworking projects are great for beginners. I attached the ¼” plywood panel to the back of the rails and styles using ¾” brad nails and glue. You can see here how the grooves in the door panel give the door a paneled look. Next, I rounded over almost every edge on the piece with an ⅛” radius roundover bit. The friend I’m making this cabinet for has kids, and I don’t want them getting hurt by running into the piece. This also gives the final piece a nice, clean look. If you don’t have a router, you could just as easily break the edges with sandpaper. I trimmed the edge of the top square at the miter saw, rounded over the edges, then spent some time sanding it to 180 grit. I also sanded the rest of the pieces to 180 grit as well. I applied a water based stain from General Finishes next, this is the Espresso color. It went on a little darker than I expected, even after doing a few test pieces. This wasn’t a huge deal, because I was already planning to distress the piece after staining to match what the client wanted. To distress the piece, I used 320 grit sandpaper on my random orbit sander. I made sure to hit the corners and edges of the pieces a little extra to make the wear and tear look more authentic. I was surprised at how easy this was, and I think it really gave the final piece a nicely distressed look. The 320 grit sandpaper also helped to smooth out the surface, since the water based stain raised the grain. Next, it was time to apply finish. I started by spraying on two coats of General Finishes Sanding Sealer with my HVLP system. 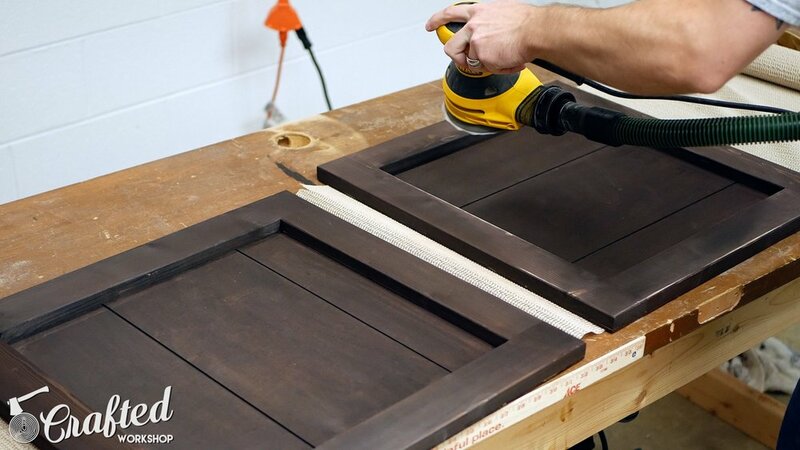 This seals the stain nicely and allows you to sand to an extremely smooth finish before applying your actual finish. After sanding the sanding sealer with 320 grit sandpaper, I applied three coats of General Finishes High Performance, sanding in between coats. I wanted the shelves in the DIY sideboard to be adjustable, so I whipped up a quick shelf pin jig at my drill press. This fence system on my drill press made it super simple, I just drilled a ¼” hole every inch in a piece of scrap plywood. 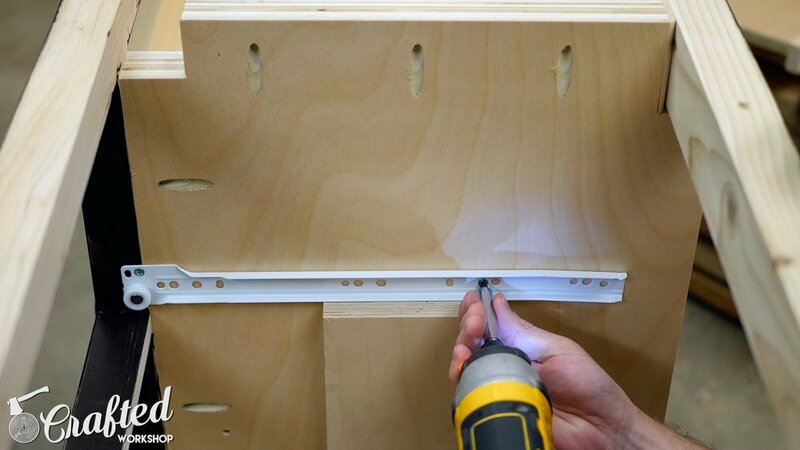 To drill the shelf pin holes, I used a ¼” drill bit with a depth stop set to the depth of the pins. I’m really glad I didn’t waste $30 buying one of these jigs, since this only took me about 10 minutes to make. Next, I installed the drawer slides. I marked in ¾” to account for the drawer fronts plus 1/16” of an inch, which was a measurement based on this particular drawer slide, and then mounted the slides. I used a piece of scrap plywood cut to length as a support for the slides. This is extremely helpful and helps to make sure your slides are spaced evenly. These are bottom mount slides that I picked up from the home center, I’ll have links to similar slides in the video description and build article. I installed the drawer fronts using this playing card trick I learned from William Walker, check out his channel if you don’t already subscribe to him. The playing cards act as spacers so you can precisely set your reveal before attaching the drawer fronts. I attached the drawer fronts using a few 1 ¼” screws from the inside of the drawer. Next, I installed the knob in the center of the drawer front. I needed to recess the bolt slightly to give it enough length to reach the knob, and used a Forstner bit to do this. I mounted the hinges and hung the doors on the DIY sideboard using the same playing card trick again. These were a little tricky, since the screws were so tiny, but I eventually made it work. I also installed a magnetic catch to keep the doors in place when closed. I installed the knobs on the doors in the same manner as on the drawers. After the hardware was installed, it was time to attach the top. I drilled holes through the top frame to accept a few different sizes of screws. I made sure to drill these holes slightly oversized to allow for wood movement. The holes on the front of the frame had to be drilled at an angle so that the screws could be installed around the face frame. The center portion of the top is attached using the pocket holes I drilled earlier in the center and side plywood panels. This will give the top a solid center point to move outward from. Finally, I attached the back panel, which is made up of ¼” plywood, and added my stamp. With that, the buffet cabinet was done! I hope you guys enjoyed this project, this was definitely a big learning experience for me. The finishing portion was particularly challenging, with the staining, distressing, and just the sheer number of pieces I had to finish then sand, finish then sand, etc. If you liked this DIY sideboard / buffet cabinet project, please give the video a thumbs up and leave me a comment letting me know what you’d like to see me build next. If you don’t already, get subscribed to my main channel and on my second channel. Last, if you want to support me more, use the Amazon affiliate links in the lists at the top of this post. This is a free way for you to support my future projects! Thanks and, until next time, happy building!